Located around 1,500 meters above sea level, Kintamani is one of the tourist objects in Bali that is visited by thousands of people especially during holiday seasons. A lot of domestic and international visitors go there. 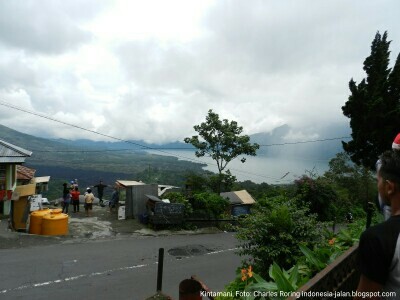 In Kintamani, tourists can see the beautiful landscape scenery of Lake and Mount Batur. Going there - Kintamani can be reached by cars or motorcycles from Ubud going up moderate slopes of road that passes through farmlands and terracess of rice fields in Tegalalang, Ceking, Jasan, Sekahan, and Penelokan. It takes approximately 45 minutes ride from Ubud to Kintamani. From Bangli, it is approximately 40 minutes and from Besakih, it is 1 hour. Activities - When in Kintamani, visitors can take pictures of the beautiful scenery , and enjoy spicy Balinese food or other Indonesian delicacy in a number of restaurants in Penelokan that overlook the Batur Caldera. Further exploration of the area can bring visitors down the caldera to hotspring temple in Toyabungkah, or lake crossing from Kedisan to Trunyan for seeing the Trunyan Graveyard. Bali Aga people do not bury their deceased relatives. They place the dead on the ground covered by bambo cage until the body is decomposed. After that, they will relocate the skull and the bones on stone altar some 500 meters away from the graveyard for final rest. Going further to northeast along the shore of the lake, visitors can reach Pura Ulun Danu which is considered as "head of the lake." It is the place where holy water is taken from the lake. The pura is highly revered by the community. It is highly advised that visitors respect the holiness of the temple. Visitors can enjoy fresh air during the day but the weather can be very cold during windy night. Visitors who are not accustomed to cool temperatur should wear warm clothing. Fog often covers the caldera and its rim areas causing the temperature even colder even during the day. Kintamani is actually a huge volcanic caldera. Therefore, it is not surprising to see the fertile flat land along the shore of Lake Batur fully covered with various agricultural produce. Farmers grow vegetable and fruit crops which they sell to nearby restaurants and hotels. They also raise tilapia fish that are kept in floating cages in the lake. This aquaculture pratice has been closely studied by government and environmental NGOs for its impact on the lake environment.